Long story short: It was NOT the battery! Nor the starter! Nor the alternator, nor angels, nor principalities, nor powers, nor things present, nor things to come.... Whoops! I let my Baptist slip out. Anyhow, Ben found out that the battery cable had slipped off the battery post. He put it back on but it wouldn't stay because the post was too skinny. (Too much cleaning by my automotively-obsessed nephew?) So, being the resourceful redneck that he is, Ben took some tinfoil, folded it up into several layers, and wrapped it around the post to thicken it up! Brilliant! Now my "new" car has a bluegrass fix! Sunday, however, I went to Frederick, Maryland, where the Picnic Hill jam is still in full swing when we all can make it. The bad news was I had come down with laryngitis and couldn't sing a note. The good news was that everyone in that jam sings! So all I had to do was sit back, think of England, and play guitar! 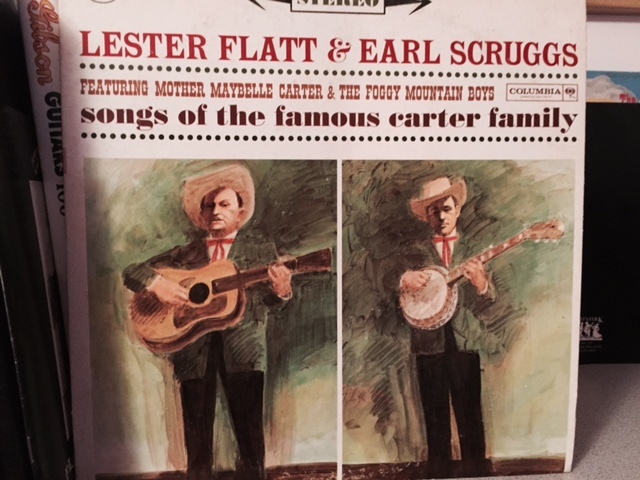 For a pre-jam treat, Pam brought over all some wonderful old Flatt and Scruggs vinyl LPs that she'd bought off Craig's List. She said even if she never played them the covers were worth the five bucks a piece she paid. I have several of the same albums so I'll include pictures here. 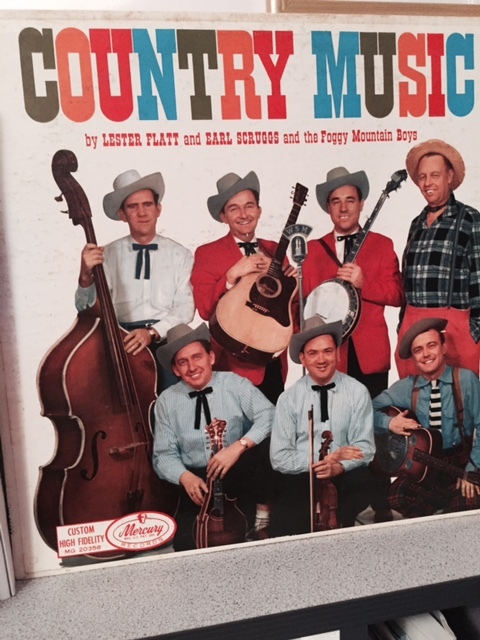 As I told the jammers that Country Music album includes the original Mercury cut of Foggy Mountain Breakdown. 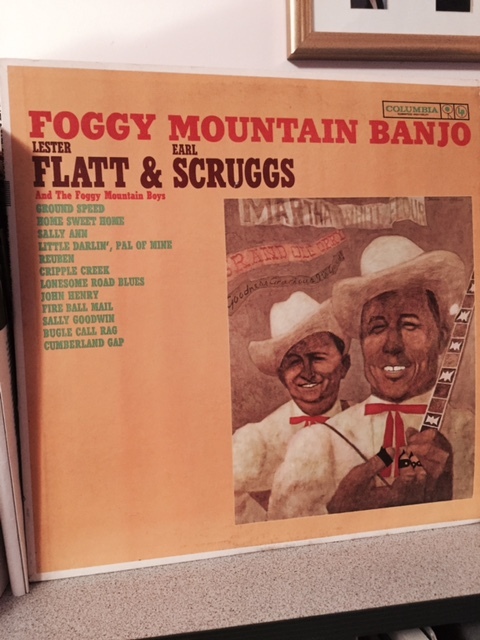 And of course Foggy Mountain Banjo has so many of the Scruggs classics: Cripple Creek, Cumberland Gap, Lonesome Road Blues. In fact, all of them are classics! Of course Pam was not content to simply look at the covers so she borrowed her daughter's brand-new vinyl record player which she had gotten for Christmas. (Apparently those are all the rage; Kasey Smelser got one, too. I understand they come in a carrying case so they are easy to transport. Deja vu, baby boomers?) Now her daughter is asking her, "Will I ever get my record player back?" But the real reason I'm writing this blog is to tell you about Tim's lesson, which he took after the jam. It had been so long since we'd had a lesson that I'd forgotten what he was working on. He told me that he'd been working on Uncloudy Day, which is a song we added to the jam after Kathy heard it on our Hicks Sisters CD. So Tim played the song and I accompanied him on guitar and it sounded really good.....except for the last line. He was coming up short. "Do it again, Tim. You're coming up short," I said. He did it again, and he was still short. Two beats short. His break ended before I got finished playing the chords on the guitar. Normally at this point I would sing the song lightly on top of his break so he could hear what I was talking about. But I had laryngitis and couldn't sing a note! Now, since Tim is good at making up Roly Poly breaks, I figured that he had made this break up. But then, in my quest to figure out how to correct what was wrong, he said something about having learned it that way "from the DVD." "I don't know. I think it's the Amazing Grace DVD." "I don't think it's on the Amazing Grace DVD," I said. "The only DVD I remember teaching Uncloudy Day on is the DVD about playing in C---Wildwood Flower, I think." "Well, I still think it's the Amazing Grace DVD. I know I learned it from one of them." "Hey," I said. "Kathy's got an Amazing Grace DVD lying right here. Let me look." I picked up the DVD. "Nope, it's not here," I said. Then Tim looks at the list of songs on the DVD. "Oh, Murphy, I'm sorry! It's not Uncloudy Day! It's When The Roll Is Called Up Yonder! That's the song I was playing." Ah! A light goes on in my head. No wonder the song sounded so good! (No disrespect to Tim!) It was my own fracking arrangement! So here's why I'm telling you this. The whole time I was sitting there playing guitar I was hearing Uncloudy Day in my head! And, except for that last line, everything Tim played fit perfectly! It sounded like Uncloudy Day to me! But now, when we played it again, both knowing it was When The Roll Is Called Up Yonder, the whole song sounded better. It was noticeably tighter. Frankly, it was weird. I can only suppose that hearing the "correct" words made me phrase my guitar playing slightly differently and maybe it made Tim phrase his break differently. We both had a good laugh about that! And now you can understand the title: When The Roll Is Called Uncloudy Day!